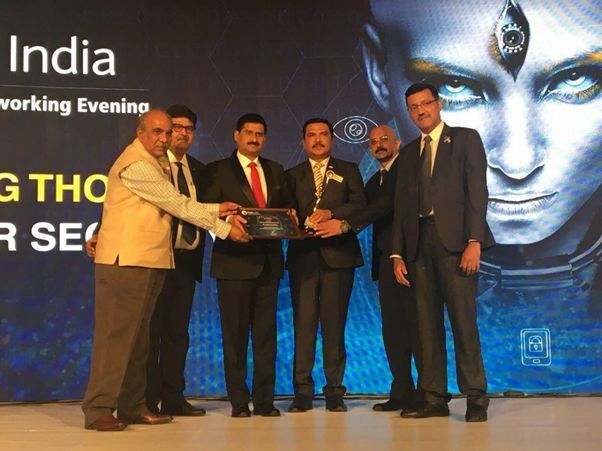 Mr. Gopal Choudhary, Chief Security and Brand Protection, Tata Steel was awarded the ‘Lifetime Achievement Award for contribution to Security and Business Continuity’ at the IFSEC India Awards. The Awards ceremony took place on the sidelines of the 11th edition of the International Fire & Security Exhibition and Conference (IFSEC) India Expo, South Asia’s leading security and surveillance show, which took place at New Delhi from December 6 - 8, 2017. The IFSEC India Awards aims to reward and recognise innovation and excellence in the security space, and is deeply coveted, contested and closely watched by industry stake holders within the burgeoning electronic security, surveillance and safety systems domain in India. This year, the IFSEC India awards received over 120 nominations and announced the winners on 6th December 2017 at a glittering ceremony at The Lalit, New Delhi. The Jury based awards are chosen after due deliberation and consensus by a distinguished Jury Panel. This Padma Shri Dr D R Kaarthikeyan, IPS (Retd) Former Director CBI, distinguished security professional and presently Chairman, ASSOCHAM National Council of Homeland Security, headed the jury panel. Other distinguished members included Mr Arvind Ranjan, IPS (Retd) Former Director General CISF and National Security Guard (NSG), among other distinguished professionals. IFSEC India Expo is South Asia’s largest security, civil protection and fire safety show, organised by UBM India, a subsidiary of UBM plc, the leading B2B ‘pure play’ listed event’s organiser in the world, and no.1 in the US and Asia. Its Head Quarters are in London. Tata Steel Group is among the top global steel companies with an annual crude steel capacity of 27 million tonnes per annum (MTPA) as on March 31, 2017. It is the world’s second-most geographically-diversified steel producer, with operations in 26 countries and a commercial presence in over 50 countries. The Group recorded a consolidated turnover of US $18.12 billion (INR 117,420 crore) in FY17. Tata Steel Group is spread across five continents with an employee base of nearly 74,000. Having bagged the Deming Application Prize and Deming Grand Prize for continuous improvement in 2008 and 2012 respectively, Tata Steel has now been recognised as the global ‘Industry Leader’ in ‘Steel category’ by Dow Jones Sustainability Index (2015). Besides being a member of the World Steel Climate Action Programme, Tata Steel has also been felicitated with several awards including the Prime Minister’s Trophy for the best performing integrated steel plant for 2013-14 (received in 2017), Best Risk Management by CNBC TV18 (2016), ‘Best-in-class Manufacturing’ award from TIME India (2016) and the ‘Most Ethical Company’ award from the Ethisphere Institute (2016), IIM Sustainability Award (2015), among several others.